Malty craft beer and chocolate are the best of friends. Few would refuse a chocolate porter dessert, especially when it also happens to be well suited for morning coffee. This is what I am talking about. Dulche de leche flavored pizzelles bound together by chocolate porter and semi-sweet chocolate sauce and decorated with more of the same rich sauce. A caramel-ish, crispy and airy, melt-in-your mouth Italian thin waffle and beered-up chocolate. Our son is in a bilingual program at school where half of the day he learns everything in English and the other half in Spanish. This school year his Spanish teacher is originally from Uruguay and throughout the first grade she often brought to class different treats to introduce the kids to popular Uruguayan foods. The uncontested favorite is dulce de leche. Those six year olds are crazy about it and now all of us moms flock to Trader Joe’s to buy jars of the spread. So I used the subject chocolate porter as a melting agent for chocolate buttons. Boulder Beer Shake Chocolate Porter has a bit of a following around here and it is not at all hard to see why. It is a porter that plain and simple does justice to cacao – a self standing chocolate porter dessert. Boulder Brewing is actually Colorado’s first craft brewery, established in 1979! Not much to write about in terms of how to make this super easy chocolate porter dessert, except for that I did have tons of fun actually painting with the sauce. Cheers you all – headed out to celebrate Saturday night and Mother’s Day tomorrow! Wishing to all moms to be surrounded by love (and not just tomorrow). PS. 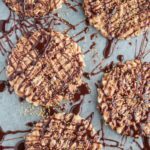 About the pizzelle sandwiches with dulce de leche I made for the kids – gone. Faster than lolly pops. Whether you'll have these with your coffee or as dessert with a small glass of porter, they are going to impress you 100%! 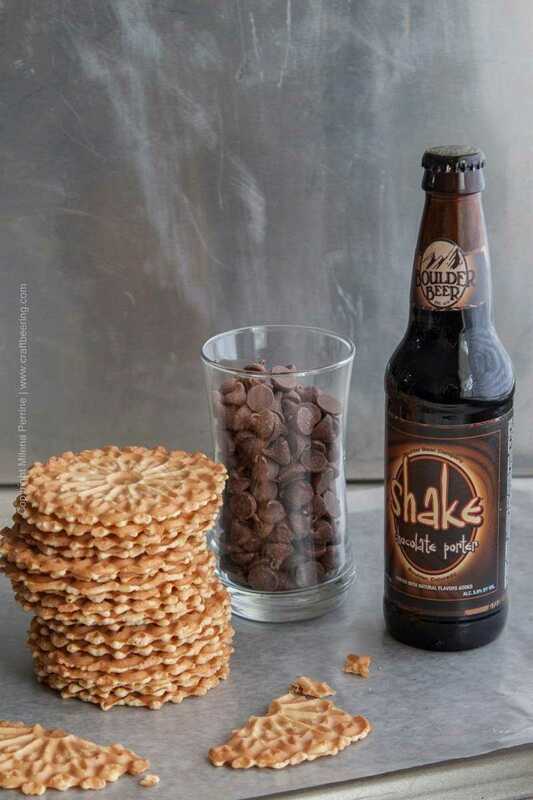 Choose a chocolaty porter as a melting agent for choc buttons and you will create a sauce you can paint with (yes paint) or drizzle over pizzelle. Heat the beer in a small sauce pan until it begins to simmer. Remove from heat. In a small bowl place the chocolate buttons and pour the warmed beer over them. Stir gently until all the chocolate has melted and you have a thick and smooth sauce. Let the chocolate mixture cool off to room temperature. Use about 1 tsp of sauce to glue together two pizzelles, forming a 'sandwich'. 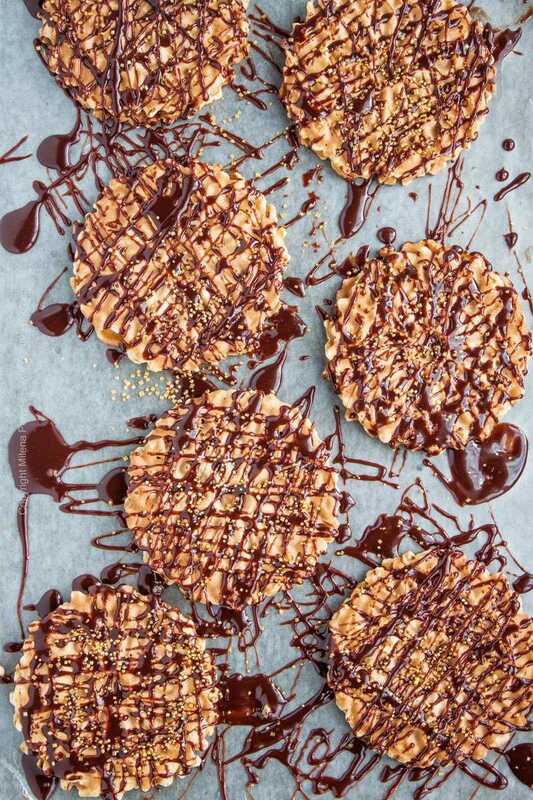 Arrange all the pizzelle sandwiches over a baking sheet covered with parchment paper. 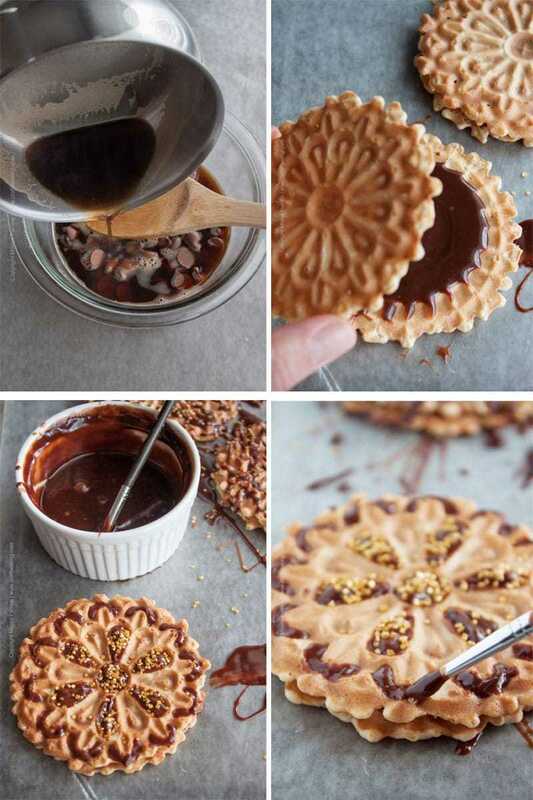 Use the remaining sauce to drizzle over the pizzelle or if you are in a creative/crafty mood, grab a thin paintbrush, dip it into the sauce and decorate the pretty shapes on the pizzelle. Let the sauce set and firm up before serving. Love the sound of chocolate and some beer with morning coffee. These look so adorable! Yummy! I would love to have on of those pizzelles right now. This seems like an awesome recipe, Milena and Chris! 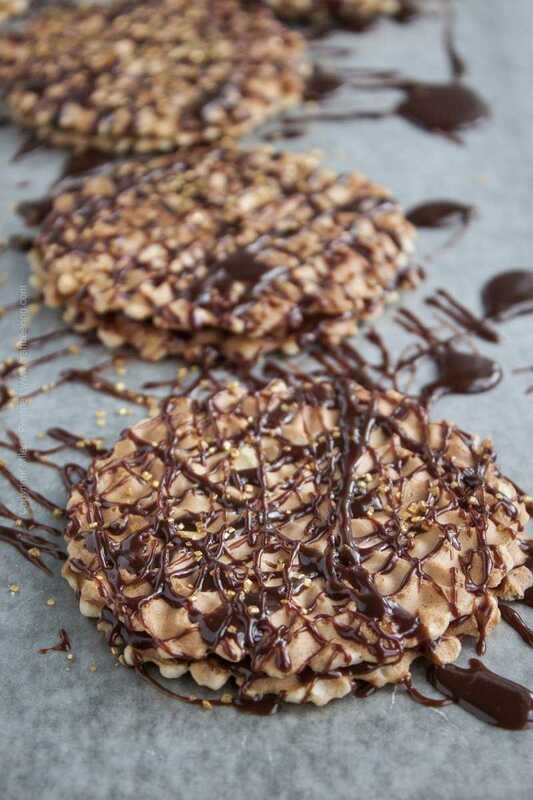 Pizzelle. And chocolate. And chocolate porter. I’m sold. Really craving one now 😉 ! Of all people I know that you know about pizzelle Nicoletta:). 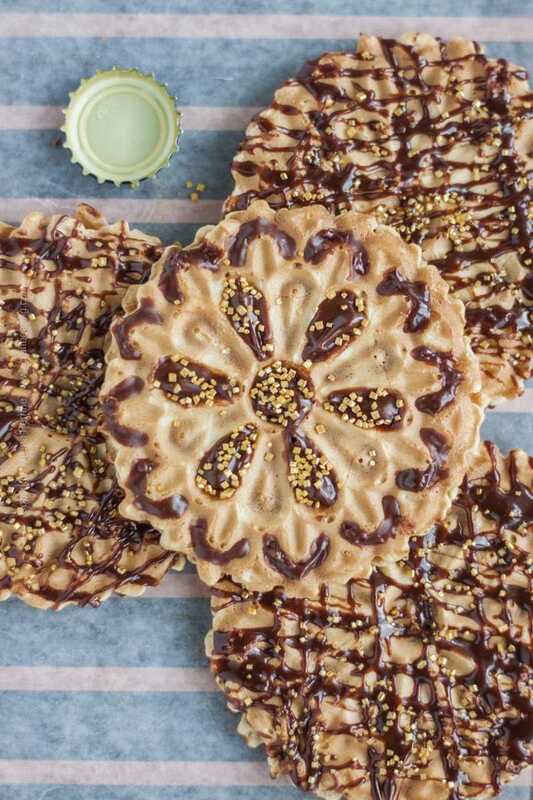 Pizzelle is quickly becoming our favorite treat to have around. Porter is one of my favourite types of beer and then you go ahead and combine with a dessert?! Woo hoo! These look gorgeous, Milena! I would have so much fun painting these too! Let out my inner artist 😉 I can completely understand why these disappear so fast because I bet they taste just as good as they look! Hope you had a wonderful Mother’s Day weekend! Thanks Dawn!Painting with a chocolate beer sauce was almost like a meditation, haha! These look unbelievable! Seriously, is there anything better than dulce de leche? I guess dulce de leche with chocolate and beer :). Happy Mother’s Day, Milena! Thank you Kelsie! Dulce de leche is quite an addiction:) Not too sweet, but so rich and beautifully caramelly!